Hillary Clinton surrogate Ed Rendell, who has come under fire recently for sexist remarks, has a history of making similar statements. The former Pennslyvania governor commented on American women Wednesday in an interview with the Washington Post. "There are probably more ugly women in America than attractive women," Rendell said. During a CBS '60 Minutes' interview in 2011 with Lesley Stahl, Rendell called the female reporter a simpleton and an idiot. "You're simpletons, you're idiots if you don't get that," Rendell said. In 2010, during an interview with Philly Mag, Rendell denied having extramarital affairs but toyed with the idea. 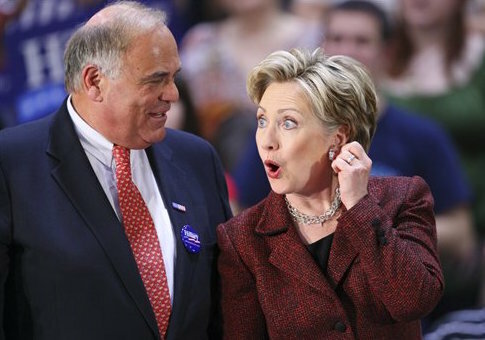 "I do not have affairs with women," Rendell said. "And it’s really unfair. It’s particularly unfair to attractive women. I should go out and find an unattractive woman to have an affair with." In 2008, Rendell was caught on a hot mic making offensive comments toward Janet Napolitano, Obama's Homeland Security nominee. "Janet is perfect for that job. Because for that job, you have to have no life. Janet has no family. Perfect," Rendell said. During an interview with Lisa DePaulo in 1994, Rendell made multiple sexists comments towards the female reporter. "Take it off, Lis! Take everything off!" she wrote that Rendell shouted at her from the sidelines. Later, the article says, the mayor joked with a City Hall janitor that "Lis must have a spiked metal bra on or something, 'cause we almost didn't get in." He then described in vivid detail how he presumes DePaulo would be in bed. He then "proceeded to tell me, in raw and alliterative terms, how he presumes I am in bed. All of which he says I should find flattering," the article said. Rendell has since apologized for his latest unfiltered remark calling it, "stupid and insensitive." This entry was posted in Issues and tagged Ed Rendell, Hillary Clinton. Bookmark the permalink.